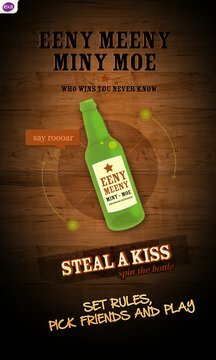 Spin the bottle and steals a kiss. Perfect game for party! Spin the Bottle Kissing Game. Perfect for a party, great fun for girls and boys !!!. 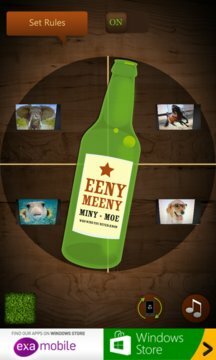 Spin the bottle is a party game in which several players sit in a circle. The game starts by one player spinning a bottle. Whomever the bottle points to, the spinner must kiss. The kisses becomes the next spinner. A high stakes variant of the game requires that the person that the bottle is pointing to has to take off an item of clothing until one player is naked.